Salt creep occurs when the water in an aquarium that contains salt splashes out of the tank, gets things wet, and after the fresh portion of the water evaporates, all that is left behind are salt crystals. What Are the Effects of Salt Creep? Salt is a corrosive substance, and therefore it can affect anything it touches. What degree of damage occurs primarily depends on how long an item is exposed to sodium chloride, and based on what type of material it comes in contact with, its effects are seen in varies ways. Glass, acrylic, and plastic become "etched". Where the saltwater settles and dries, residual white water spots develop, and glass, in particular, takes on a foggy appearance. Electrical items corrode, especially metal parts of light fixtures, equipment power plugs and the outlets they are connected into. Unprotected bulbs become encrusted with a layer of salt, which blocks light from getting into the aquarium. 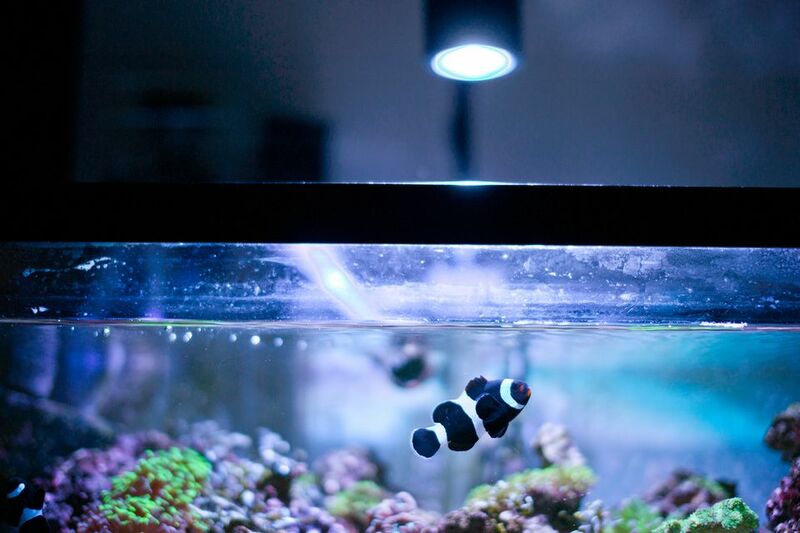 Protective glass and acrylic light covers or canopies become encrusted, as well as etched, resulting in a reduction of light into the aquarium. Wood, cement, plasterboard or drywall, drapes or curtains, carpet and flooring materials slowly erode away and paint peels off. Keep the tank, hood, stand, light fixture and other such items clean by wiping them down with a cotton rag or washcloth rinsed in freshwater. For unsightly white water spots that can develop on plastic items that are outside of the aquarium, a touch of vinegar applied to the cloth may help to reduce their appearance. Remove and rinse off pieces of equipment that can be cleaned in freshwater, this includes equipment that has an electric motor. If an electrical device has been exposed to (i.e. immersed in) saltwater, you are far better off to rinse it thoroughly in freshwater (not when it is plugged into a power source), then dry it, than you are to let the corrosive effects of the salt take its toll on the equipment over time. Position electrical equipment out of range of splash zones. Unplug and wipe down electrical equipment power cords, plugs, and outlets. Protect nearby walls by attaching a sheet of clear acrylic to act as a splashboard. Place towels on the floor around the bottom of the aquarium during maintenance procedures. Keep the water level up to or just above the tank's trim line to help reduce etching of the aquarium material. Avoid using bubble wands or air stones, as these only contribute to an increase of salt creep problems. Direct the flow of outlets that return water to the aquarium, as well as equipment that is used to move water inside the aquarium in a way that reduces excess splashing. Many aquarium cabinets and stands are open in the back. If you have a sump under your tank, saltwater will splash not only inside the cabinet but out the back and onto a wall or the floor. It may only be a drop or two (hardly noticeable) at a time, but over time it adds up. Placing a thin sheet of acrylic over the opening in the back of the cabinet will keep the drops of saltwater from escaping the cabinet and damaging the floor and wall behind the tank. Paint any unpainted wood surfaces (aquarium cabinets and stands) with a good quality enamel paint. This makes the wood surface easy to keep clean and salt-free with the wipe of a damp cloth and keeps the salt from soaking into the wood where it will be next to impossible to get rid of.